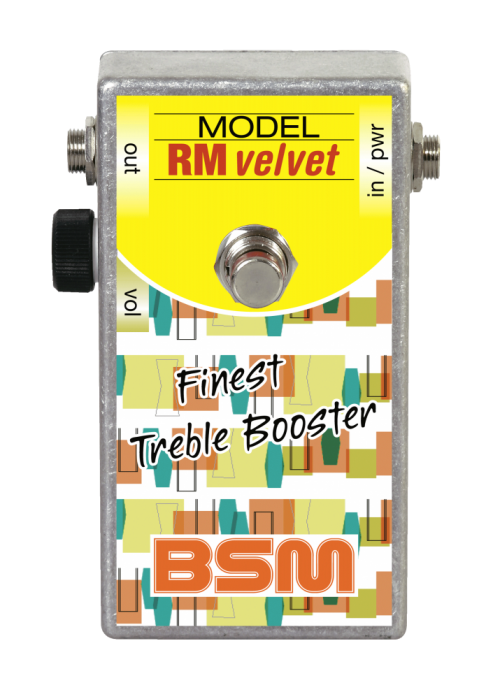 The BSM Velvet model is based on the British Range Master unit produced between 1965 and 1969, as used by Eric Clapton in John Mayall"s Bluesbreakers. Eric also used the booster when playing in the legendary group Cream. Its biting, powerful sound is clearly in evidence on the Bluesbreakers "Beano" album. Blues rocker Rory Gallagher, Glam rocker Mark Bolan, Heavy Rock pioneer Tony Iommi and Brian May from Queen were also heavy users of the original Range Master unit. The RM Velvet is the result of a lot of customer demands, looking for the perfect Blues machine. The RM Velvet is loaded with the same highly selected OC76 transistor, used for the famous BSM OR model and therefore sounds much smoother and silkier than it's brother with the OC44. The tone of the RM Velvet is rounder and warmer than a stock RM and the perfect machine if you are looking for the ultimate Blues pedal. If you have any questions concerning our products, especially the BSM RM Velvet Treble-Booster, our tech-head and mastermind Mr. Bernd C. Meiser would be happy to talk to you. So don't hestitate any longer and send him an email to info@treblebooster.net or use the contact form to contact him.